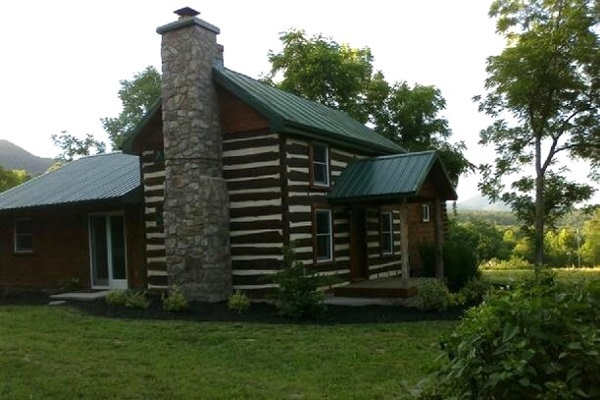 Beautifully-appointed 1850's authentic log cabin is fully restored with a new, great-room addition. An elegant and private master suite features a double-size shower for two. A working, stone fireplace adds to the master suite's romantic atmosphere -- appeals to the the passionate at heart! A Sweet Water Hot tub for 6 and firepit adds to the cabin's outdoor attraction. Deck with handicap ramp features million dollar views of Kennedy's Peak and the famous Blue Ridge Mountains. Walk to a secluded fishing pond without leaving the property. Surrounded by nature, wildlife, with US Inland Fisheries and G.W. National Forest close by; affords easy access to G.W. National Forest for Horse Loverz (with short trails on site). We're horse and dog friendly. Massanutten Boat Landing is walking distance - bring your own motor boats, jet ski with rentals available from local outfitters. The historic and elegant 1850's Massanutten Springs Retreat offers a perfect combination of a luxurious get-away and an action-packed vacation -- with a touch of pre-Civil War atmosphere. Within minutes of the 1850's Massanutten Springs Retreat is a public boat launch and nearby rental facilities are available to set you up with ski-boating, jet-skiing, power-boating, canoeing or kayaking the South Fork of the Shenandoah River. The winter season offers nearby skiing and snowboarding -- within minutes of Massanutten Springs. With breath-taking views of the Massanutten Mountain as your backdrop, and a completely renovated, fully upgraded, pre-Civil War homestead as your location, the historic 1850's Massanutten Springs is a picture-perfect après-ski retreat! Massanutten Springs is a beautiful location for a family reunion, outdoor wedding, or a memorable honeymoon. The 1850's Massanutten Retreat is a haven for bicycle enthusiasts looking for that perfect starting point for their journeys. Bicyclists will enjoy getting an early start on their bicycle adventure at the 1850's Massanutten Springs Retreat. Within seconds of the driveway is Egypt Bend Road, where bicyclists may follow the officially designated Virginia By-way 211 in one direction and Fort Valley Road in the other. And easy trailer access to hiking and riding trails that lead into the George Washington National Forest make the 1850's Massanutten Springs Retreat a clear winner among families, their friends, and their horses! Within minutes of the historic 1850's Massanutten Springs Retreat, you can horseback ride, take an all-day bicycle trip, hike the George Washington National Forest, fish, golf, ski-boat, or jet-ski on the South Fork of the Shenandoah River to create the perfect balance of activities -- and relaxation. One of the best ATV areas in the region is within a 35-minute drive of Massanutten Springs, offering visitors 16 and older miles of off-road, four wheeling fun. Book early for the winter season -- think snow skiing, snow-boarding -- Massanutten Springs is within minutes of Massanutten and Bryce -- a perfect starting point for your winter holiday adventure! Rates from $185 - $235/night. Please email or call 540-843-4232 for current pricing. Ask about seasonal specials. Nightly rate includes 6 people. Additional people are $25/night.